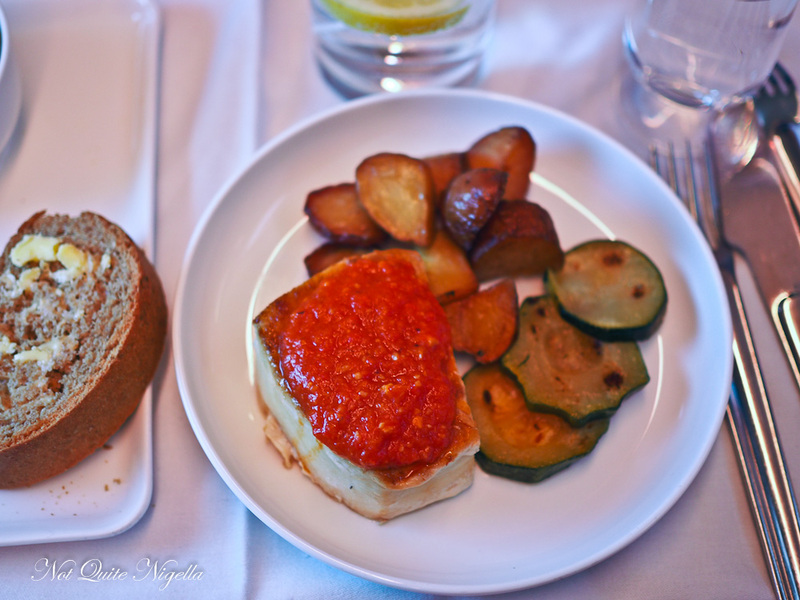 Dear Reader, did you know that a 14 hour flight goes faster if you have a friendly seatmate who is willing to let you take photos of their food? 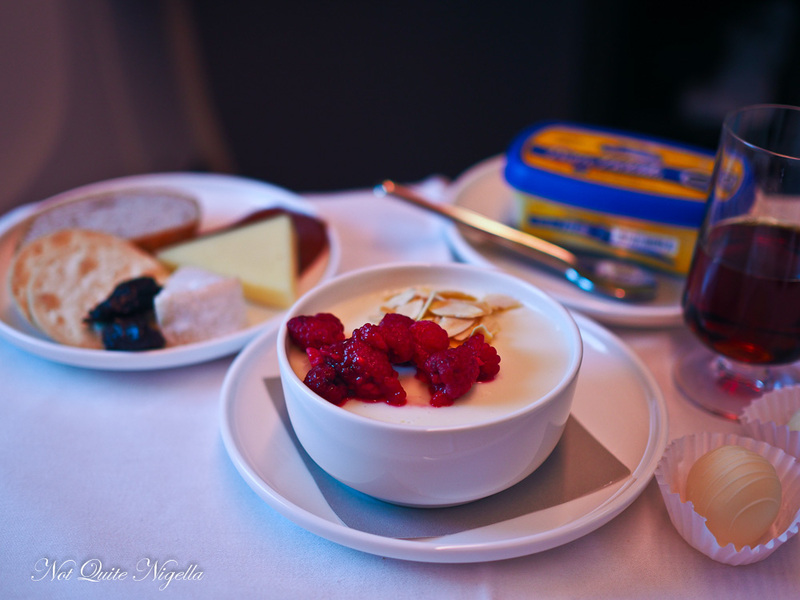 Come along for an unexpected business class flight! "Cheers!" 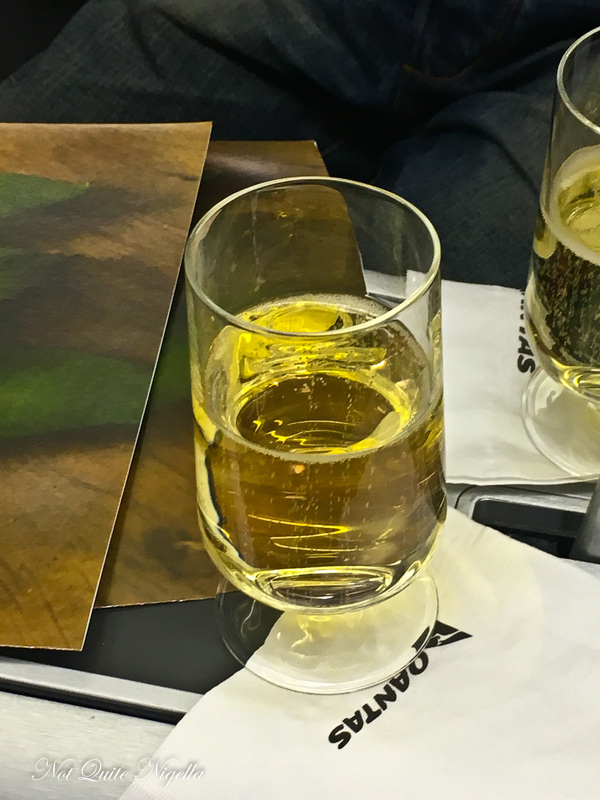 says the guy beside me raising his glass as they pour a round of champagne on the plane. He's the friendliest business class seatmate I've had. Usually people say hello and maybe few words but they keep to themselves. I'm on a flight from Santiago to Sydney having juuust made it with a 1 hour transfer between this an a LATAM flight from Lima to Santiago. Luckily there is a Qantas guaranteed connection between the two flights. And a glass of champagne couldn't have come at a better time. 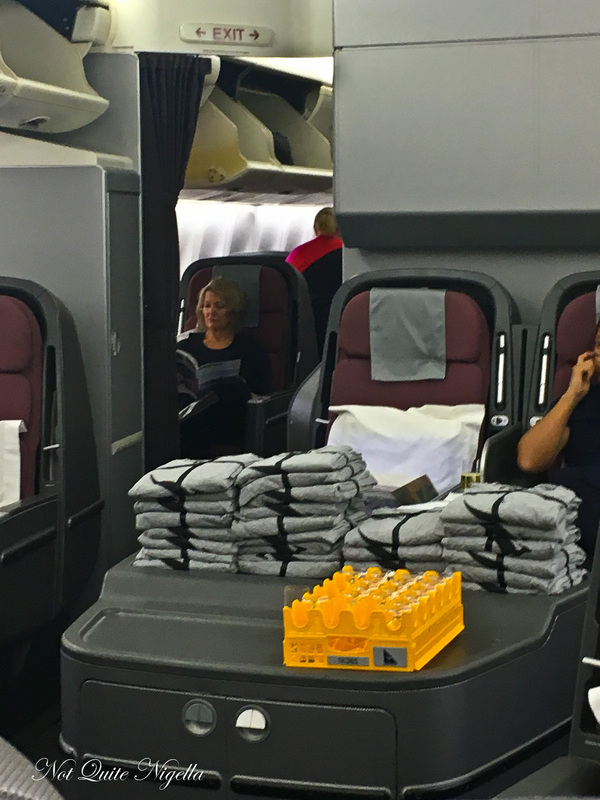 We are on the B747-400 aircraft and there are about a dozen seats free in the business class section. 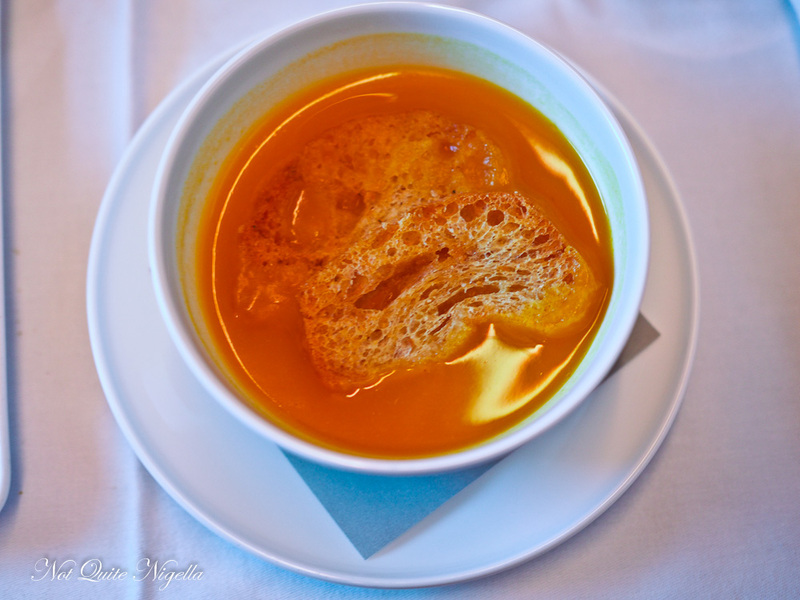 There is a brand new menu and it is said to mark the 20 year collaboration between chef Neil Perry and the airline. 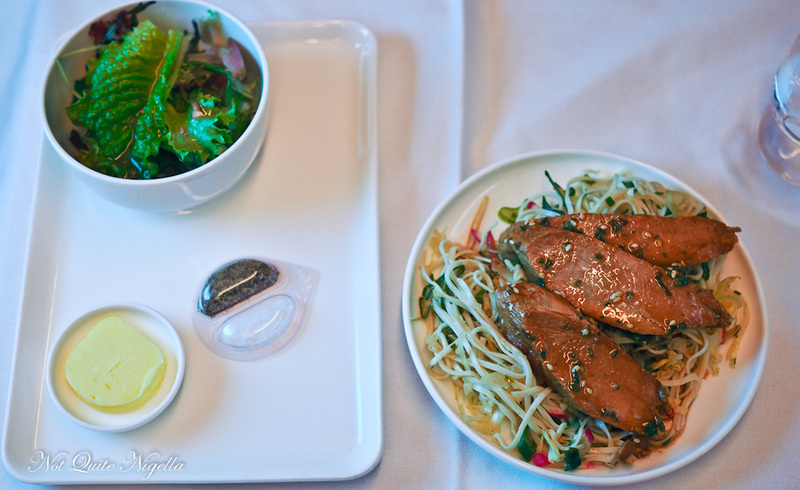 On today's 14 hour and 15 minute flight we will served lunch and then dinner. I order a Virgin Mary no ice and this is served with a bag of roasted cashews and pretzels. I'm also very hungry so I am grateful for my seat now more than ever. I'm tempted to get the chicken and corn empanadas because I like to order food that is from the departure point but instead I go for the char siu pork with wholemeal noodles, sesame dressing, ginger and shallots. There are three slices of pork that are strong in star anise. The noodles aren't quite wholemeal they're regular noodles and there is radish along with the sesame and ginger flavours that gives the noodles a slight bitterness. "Would you like to take a picture of my soup?" the guy next to me asks before offering me a taste. What a nice guy! I wanted to try the fish called Mero and it is supposed to be the other name for Patagonian toothfish. The texture is quite different to other Patagonian toothfish I had tried. It's a thick, firm fleshed fillet with a rich almond and hazelnut romesco sauce and a side of roast potato and grilled zucchini. 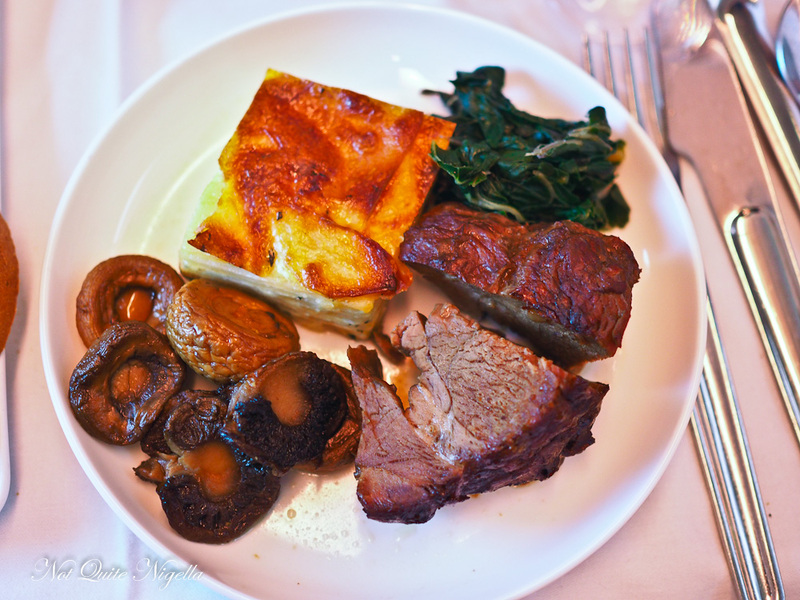 I also got to try some of my seatmate's lamb which is tender and I particularly like the sides. 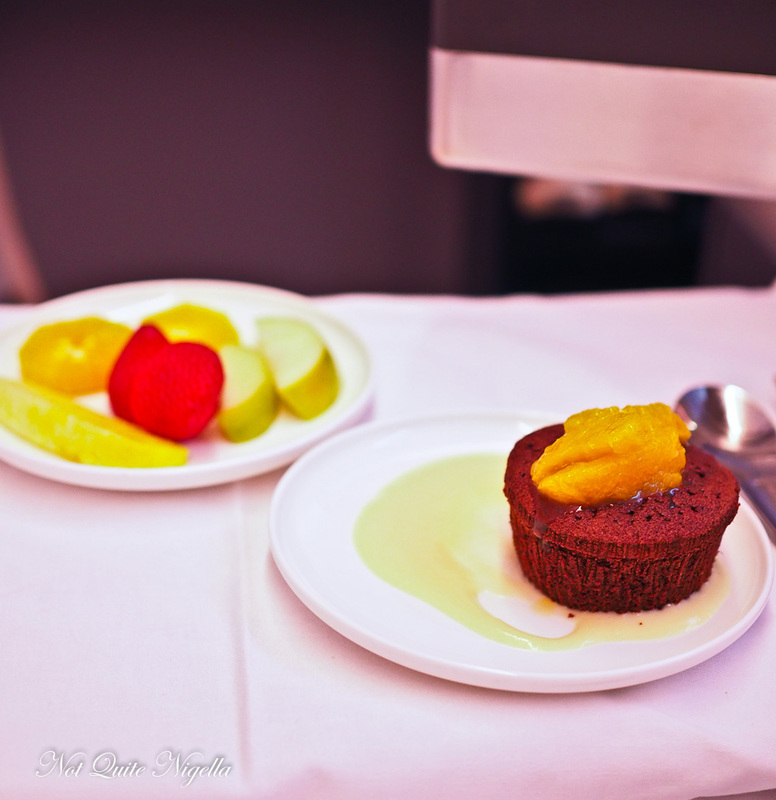 As the business class section had quite a few seats empty they swing by with the dessert trolley and an offer we can't refuse. "Here, have one of everything!" they say to us brightly, and they spread out one of literally every dessert. 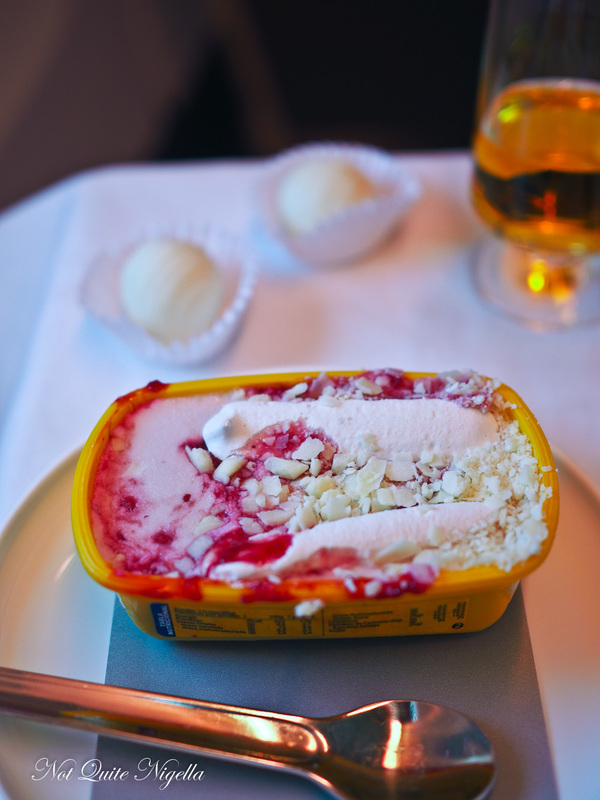 The ice cream is a little tub of South American ice cream with raspberries, meringue and white chocolate flakes (yum!). 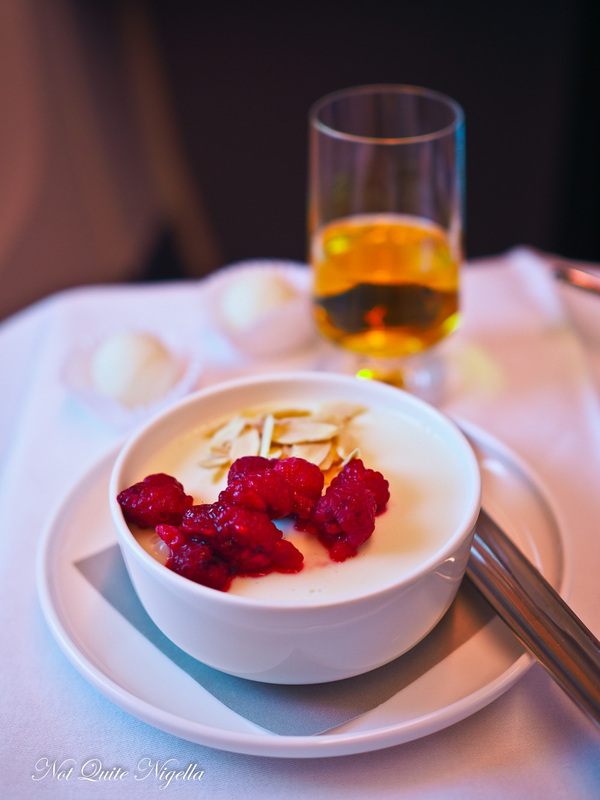 The panna cotta trifle has a layer of liquor soaked sponge at the bottom and a vanilla panna cotta on top with raspberries, lemon curd and toasted almonds (love the panna cotta layer). The cheese selection has a brie and a gouda cheese. 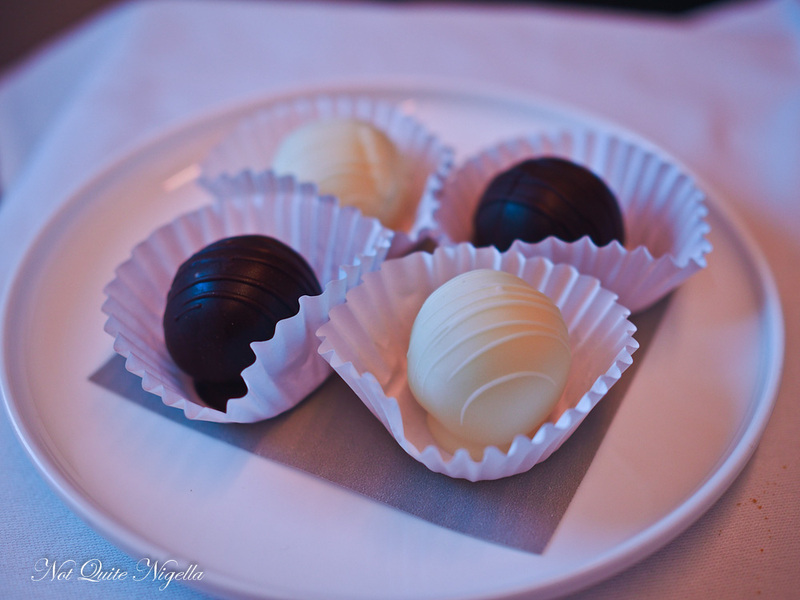 And then come the hand made dark and white chocolates. By then I'm in a sugar coma. My seatmate tells me that he hates eating, and that if he didn't have to eat to live, he wouldn't. I find this fascinating-as someone that lives to eat and cook food, this is bizarre. I tell him that I'm so obsessed with food I need a food husband that I can talk to about food all the time because Mr NQN doesn't find it that interesting. There are just over 7 hours to go so I decide to watch tv. I discover that since it is a new month a new series of movies and television have started and I gleefully watch the end of The Revenant which I love and the amazing crew stop by with apples, Toblerone and alfajore cookies. I fall asleep for 5 hours. At three hours to go, the sound of people stirring and cutlery clinking wakes me up. Then I happily discover Big Little Lies series. Damn! If only I had known this earlier as I could have binge watched the whole season! I cram as much as I can in in the remaining time. 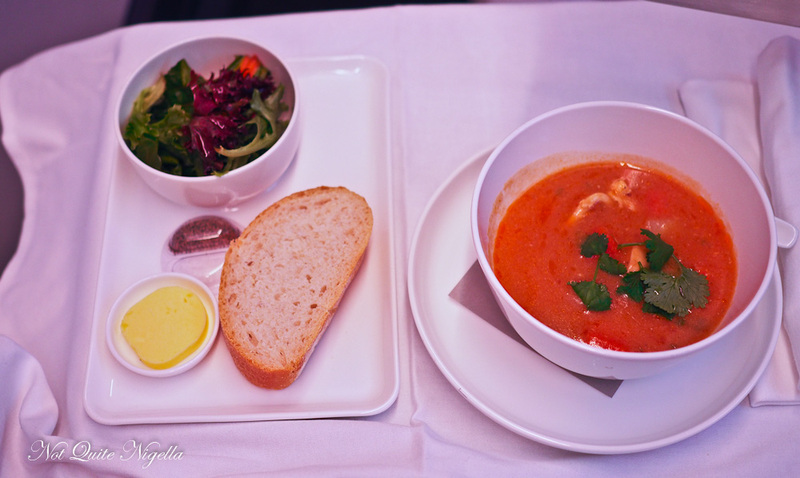 Dinner is served around 3pm Sydney time and I choose a Chilean seafood stew of mero, squid, prawns and coriander. 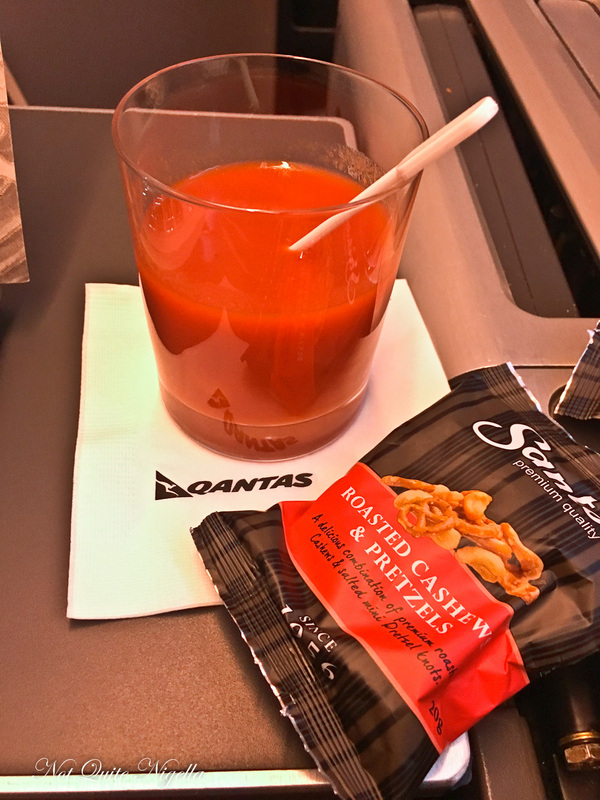 It's pretty damn good and full of flavour-I love soup on a flight. I dip a slice of wholemeal bread slathered with butter on top. Dessert is a warm chocolate brownie cake with orange compote and vanilla anglaise which is moreish. They offer more chocolates and I beg off reluctantly! 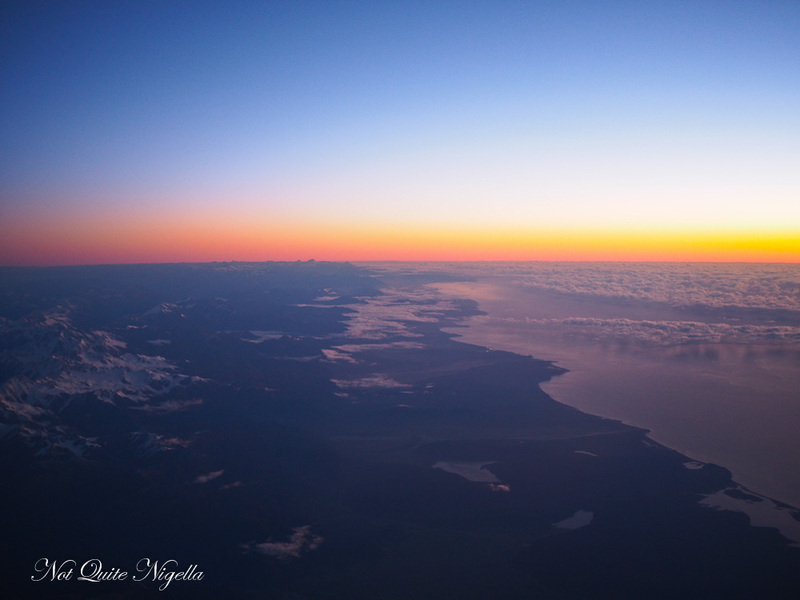 Is it possible to go up a dress size in the space of a flight? So tell me Dear Reader, do you usually talk to your seat mate? Have you got any interesting seat mate tales? And do you watch box sets or movies during flights? 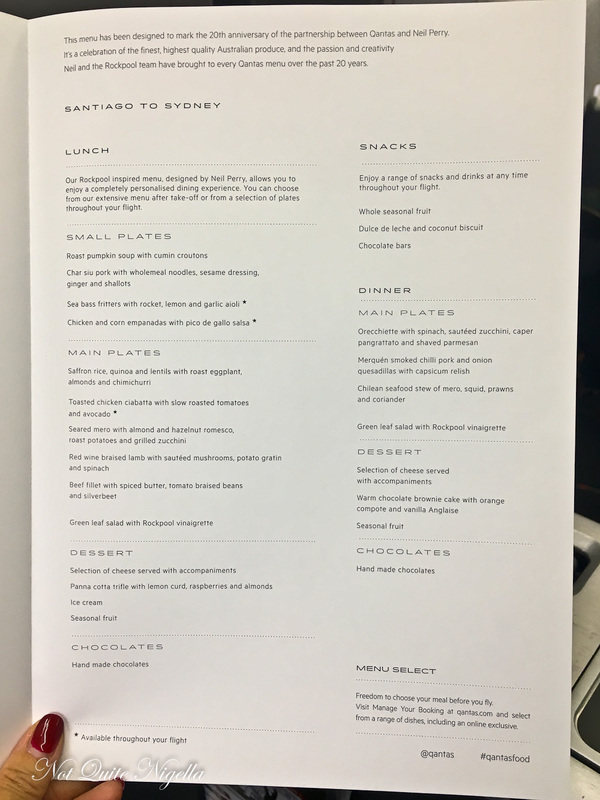 NQN flew as a guest of Qantas but all opinions remain her own. 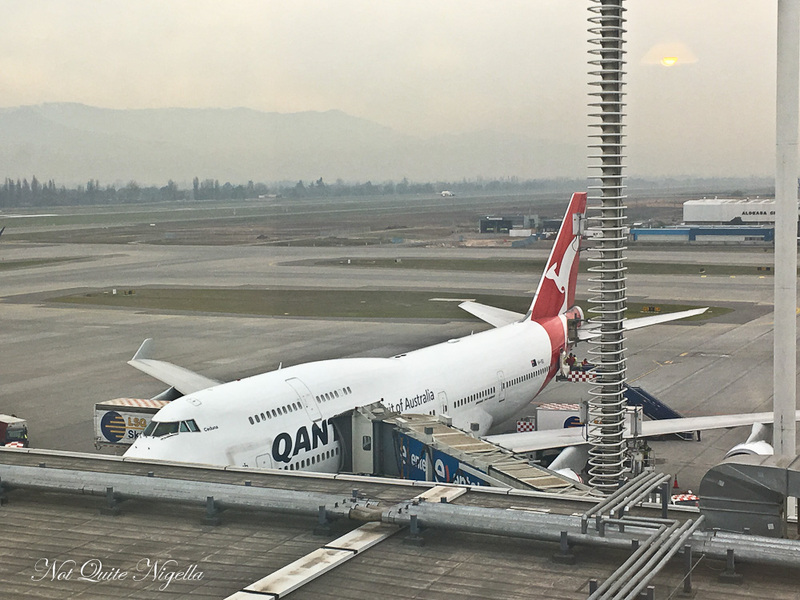 travelHow To Beat Jetlag On One of the World's Longest Flights!